Shrewsbury Town midfielder Bryn Morris, a player Luton Town were rumoured to be looking at, has signed for League One leaders Portsmouth. It was revealed last week that the Hatters had shown an interest in the 22-year-old after he impressed while on loan at Wycombe Wanderers this term. Since then, Derby County's George Thorne has joined on loan, while ex-boss Nathan Jones also left the club, although chief executive Gary Sweet admitted the transfer targets could still remain the same, ahead of the new manager coming in. 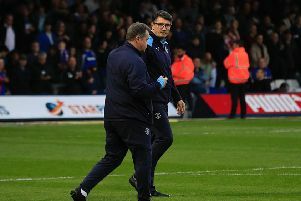 However, Morris has now headed to Fratton Park for an undisclosed fee, as Shrews manager Sam Ricketts said: "Firstly it’s a really good move for Bryn, he’s out of contract in the summer and has spent the first half of the season out on loan..
“He’s done well and wants to go and play football every week. “What we have managed to do with a player who is out of contract in the summer is to secure a transfer fee for him. Meanwhile, Pompey manager Kenny Jackett added: "He’s played against us in recent times for a couple of clubs and has excellent pedigree. “We think he’s someone who has his best years ahead of him, so we’re very much looking forward to working with Bryn. "He’s experienced playing at Fratton Park and is a progressive signing – someone who’s on the way up and hungry to prove himself here."